Some consumers do like a bit of variety in their lives and prefer to try out different devices to see what suits them best at any given time. Face it, we all do. For those who fall into that category, or even those who are just interested in what each device is capable of, then the SpecCheck Android app is a great and extremely well put together piece of software. Check it out after the jump. There are plenty of websites knocking around the world wide web that allow different devices to be compared against one another. With that said, not all of them are mobile friendly and many are ladened with obtrusive advertisements and popups that make it virtually impossible to understand what you’re reading on a small display. The intention of SpecCheck is to provide Android users with a native and efficient way of comparing devices against one another to see which is best suited for their needs. 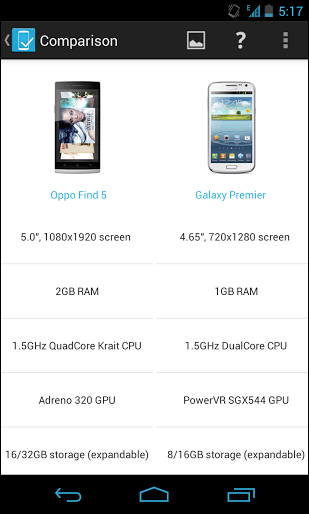 To put it in more simpler words, it’s a one-to-one device comparison tool for your Android device done right. When the app is first installed from the Play Store, it downloads a fairly comprehensive database that contains all of the devices. At the time of writing SpecCheck was able to compare over 150 different pieces of mobile kit that are spread out across the Android, iOS, BlackBerry and Windows Phone operating systems. Although the initial download process may be a pain depending on your Internet connection, it does mean that access to the devices is instantaneous and they are always available even when no Wi-Fi or cellular connection is available. Obviously a great thing if you’re on a train or just commuting, and want to compare certain devices together. 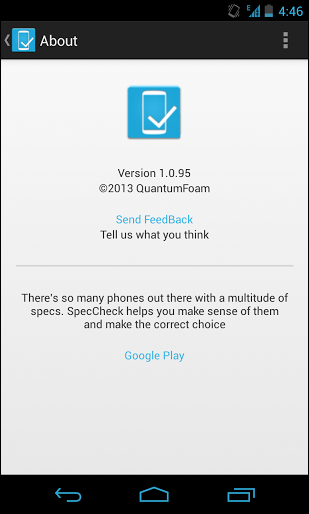 The 100% Holo themed user-interface and the ease of use makes SpecCheck an extremely great and professional app to use. Regardless of whether you are educating yourself on the best device to get when you upgrade, or just want to improve your geek status by keeping on top of the industry, then SpecCheck is a great download.